A promising sight, saucer magnolias, not cherry blossoms, but a sweet greeting on a sunny afternoon at Color. 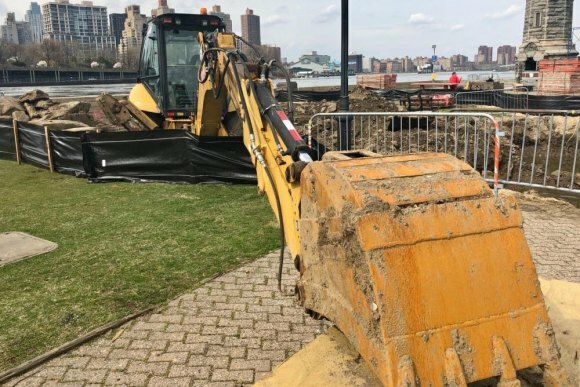 As the temperature pushed past 70 on Monday, it occurred to me that FIGMENT NYC 2019, which will consume most of Lighthouse Park is less than two months away. I pulled on my walking shoes to check the site out. What I found wasn't promising. RIOC should be worried. Very. First unexpected thing I found caused me to detour into Main Street, just after the right turn that leads past the Octagon and on to Color's main entrance. For no apparent reason, a fire hydrant, wide open, gushed a small river onto the roadway. I'd find the cause a few minutes later. Seawall work still a couple hundred yards from the top of Lighthouse Park, with only seven weeks to go before FIGMENT NYC 2019. 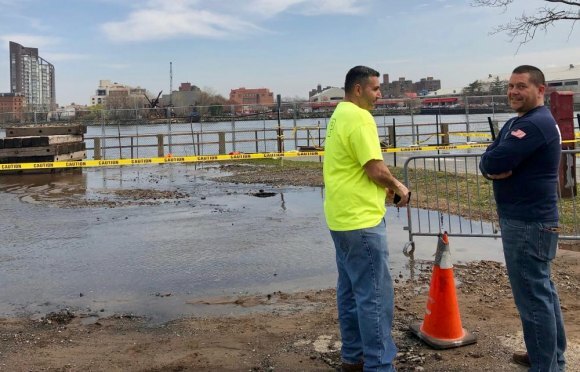 In the meantime, after seeing how far work crews were along in replacing seawall railings, part of a year long, much needed repair campaign, I thought it would take a miracle for them to finish in time for FIGMENT. But of course, FIGMENT isn't dependent on that job being done. (It won't be.) And there are large segments they can work on elsewhere. One day, these will our new, safer, better looking seawall railings. Reaching Color's parking lot, I found more water gushing, this time with DEP emergency workers onsite. Surging up from somewhere underground, it formed an even larger stream washing downhill toward the East River. DEP workers hoping to figure out where underground a pipe burst. "What happened? Did a water main break?" "That's what we're trying to find out?" a worker told me. Another man, using what looked for all the world like a high tech divining rod connected to a headset. All that was known was where the water broke the surface, not its source, the break releasing it under pressure. That, too, didn't seem likely to obstruct the creative designs coming on June 1st. But then, something else did. Idle, just south of the Lighthouse. Near the end of the Promenade path through Lighthouse Park, a giant, yellow shovel perched like mechanical carnivore that feeds on dirt instead of meat. Idled now, the machine rested beside piles of rock and earth recently tugged free. The sunken ground where high tides flood the park was a memory, still sunken, but unrecognizable. The broken bridges, victims of questionable contracting by an earlier, corrupt RIOC administration, were mercifully obliterated. 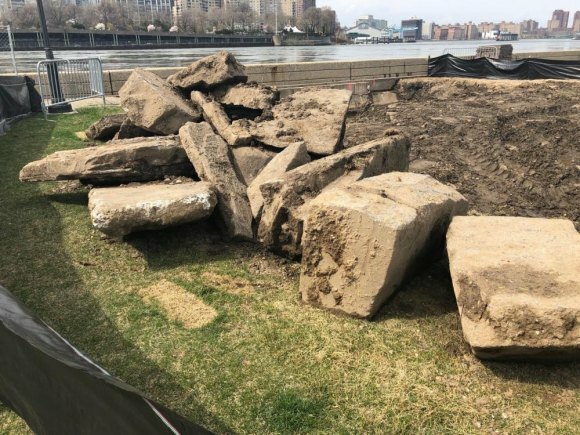 Unearthed between East River channels. 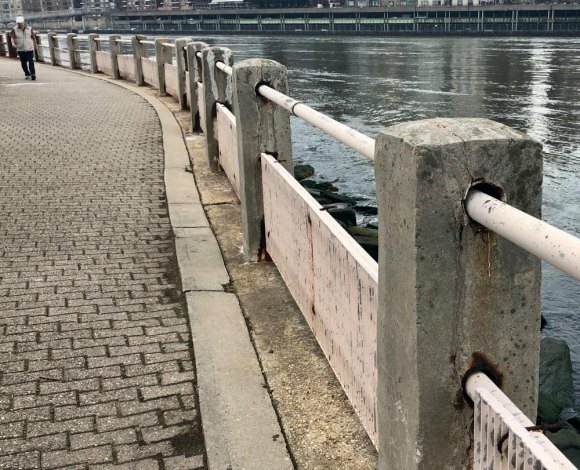 Circling around to the West Promenade, I reacquainted myself with the crumbling railings and supports I reported on, more than a decade ago, in the Main Street WIRE. Rusted and cracked seawall railings. Any chance they'd be replaced before FIGMENT brought visitors from around the world in seven weeks? One happy sight I saw along the way was a rich outbreak of saucer magnolias in a courtyard next to Color's main entrance. 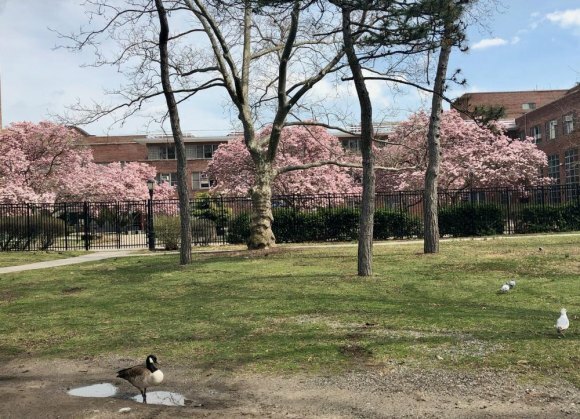 In Yorkville, a few hundred feet across the water, their pink cousins answered from Carl Schurz Park. 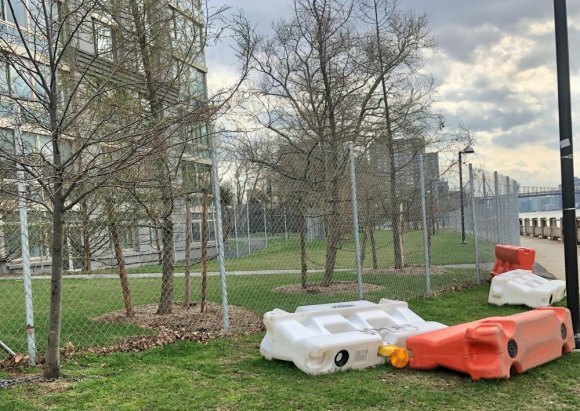 How many of Roosevelt Island's yet to blossom array of trees will make it by Saturday? 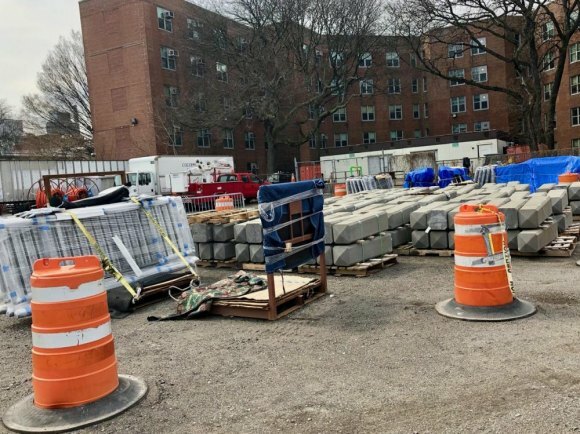 Construction projects routinely run late, this one nearly a year and counting. 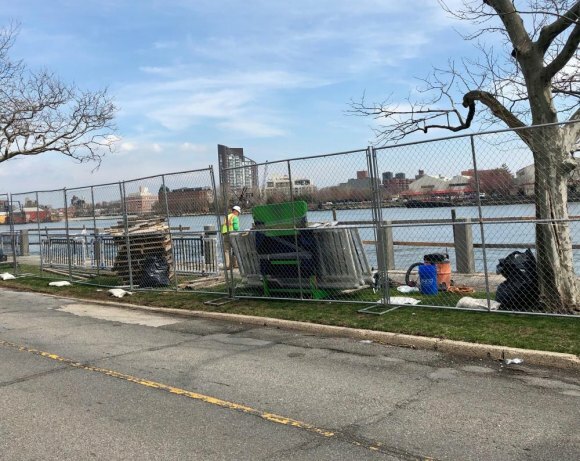 Just to be sure, as I finished my tour, the still standing fence that imprisons picnic tables and grills between the Promenade and the Octagon's playgrounds reminded me how few projects finish on time, this one nearly a year late already. Can RIOC's contractor get the bridges rebuilt and ready for traffic by the end of next month?